Let me introduce myself. I am one of those estimated 48 Lakh commuters who use public transport to get to work. I travel, on average, 50 kms both ways in a day. It takes me 3 to 3.5 hours to do the same. I buy monthly passes every month and I have seen my spending go from Rs. 1350 per month just two years ago to Rs.1800 now. During this time, the cost of diesel has gone from Rs. 46.21 to Rs. 54.82. An 18% hike in fuel has meant a 33% hike in the pass rates. There was the bus-strike in September 2012, around the time you took charge, which put life out of gear for Bangaloreans and pretty much made those two days hell. Around that time, there was speculation that fares would see a hike to accommodate the demands from employees. On cue, they were hiked in December 2012. Around that time, two months after you assumed charge of BMTC you gave an interview. When asked about how operational costs can be reduced, you had answered that “That is too complex, I cannot talk about it. These are internal matters.” I understand that things can be complex and cannot be understood by everybody. But you also mentioned that BMTC was making a loss of Rs. 280 crore and the fare hike was expected to cover Rs. 150 crore and the remaining Rs. 130 crore was to be covered with improving operational costs. We can understand and would probably take your word that reducing operational costs would be a complex issue. But surely a statement as to how much money was saved through that since your taking charge wouldn’t be too much to ask? In that interview, for example, you mentioned that there are 600 buses that needed phasing out because they had run more than 7.5 Lakh kms, and 1050 new buses were to be added by July 2013. Have these been phased out, have new ones been added? Your website says only 71 have been scrapped, while 148 have been added. What became of the rest? Your website also points out that indicators like Fleet utilisation have come down below 90% and the rate of breakdowns has gone up by 60%. A word on how you plan to address these? Apart from reducing operational costs, there is no mention of how you plan to increase revenue. Your website says that the effective kilometers between 2011-12 and 2012-13 has decreased by 0.4% and the traffic revenue has increased only by 9.4% while during the years you were making a profit, the average growth was around 15%. Apart from the estimate that 48 lakh people use BMTC every day, there are no official figures as to how many people are using the service and what are the targeted figures for the next year. Any transport company gets measured by the number of people they serve per day. That there are no official figures available for this causes some concern. On this topic, the key question is, are any efforts being made to make BMTC more attractive to people? Are there any steps being taken to improve the experience to get more people to give up their cars and hitch a ride on buses? There were talks of modernising the fleet with GPS tracking and ETMs, but no such thing has been heard about since the strike in September 2012. Even for bus day, your response was that “no studies have been done.” What’s the point in doing an exercise if there are no studies done to check if it is working or not? The previous MD of BMTC spoke about GPS-fitted buses and automated ticket machines, which would reduce the pressure for change. In your interview you mention that you plan to do it gradually, any progress on this? Just to give you an idea of the current schedules and adherence to them, the BMTC website says that a 500K leaves ITPL at 15:10, 15:45 and 16:00. However, if you wait for a 500K near Sarjapura Road, you would get either 1, 2 or 0 buses between 4 and 4:30 PM with equal probability. Sometimes I ask the conductor what time the bus left ITPL and I get answers like 3:30 PM, 3:40 PM etc. As for the BIA service, a friend who checked the website saw 20:40 as departure time from JP Nagar and landed at the bus stop. The conductor, however, said his time was 21:15. He barely made the flight. After 2.5 years I can safely say that apart from the main routes like 335E, 500C, 500D, 201R and a few more, the rest of the routes have no reliability. Tracking is urgently needed for this. You just have to make that data public, there are enough people out there waiting to cash in and generate apps for free. Please take a look at the Railways and their tracking system, and how apps work with it. Also, without an automated ticketing service, getting tickets and the right change is an absolute circus to say the least. Most of the BMTC crew operate on Obama’s campaign line of “Change you can believe in” and we spend the time in the bus wondering if change will indeed be gotten at the end of the journey. Add to that language issues and the picture is complete. Recent data released by you shows that the number of bus shelters in the city, stands at 2198 without any increase over the years. Unsheltered bus stops stand at 1438, which is 40% of the bus stops in the city! There are boards that say BMTC or a group of people standing, which we believe is the bus stop. Many times most drivers don’t. The BMTC experience is thus mostly about spending time waiting next to boards, on increasingly treeless roads, in the rain and Sun, for buses which we have no clue when they’ll turn up, and even if they do, probably won’t stop. What steps are being taken to improve this experience? Waiting for an answer. 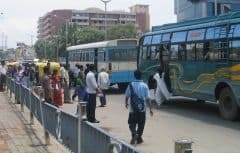 Forum urges the government to not hike bus fares, so that citizens are saved from bearing the brunt of fuel price hike. At least once in a month – at least on Bus Day, can we decide to travel through public transport? Here’s the info to help you, if you decide to travel in a bus! The recent MoU between the BBMP and the City and Council of San Francisco focuses on waste management. Will it make a difference? The BMTC has complete monopoly over Bangalore’s public transport system and yet it claims that it is undergoing loss. This is either a complete lie OR corruption is at the root of this. I believe it is a combination of these two. Corruption in BMTC is so high that even a complete monopoly is not helping it make any profit. Its high time that BMTC is not allowed any monopoly and then we would see how it would start making profits! Similarly, the Indian railways needs to be disallowed monopoly. These seem to be holy cows for the politicians and bureaucrats to mint money. The public should wake up and rise against these evils. We have cut costs by using people like you. Thank you for confirming our plan is working, otherwise we need special inspectors to make sure that people are really suffering. Now we can use that money to think up some more schemes – strike that, scams. Go buy yourself a good SUV, diesel is still cheap. Forget Volvo, thats only for use in a crisis like taking ministers to Goa… OK, got to get back to work – need to increase fares again by 50 rupees, diesel went up 50 paise. They think bangalore is only for IT and Rich people. Dear BMTC in IT companies, there are House keeping employees or low level employees, kindly keep this also in mind while taking decision. From banashankari to Whitefield there is no Normal buses , only VOLVO. Govt Bodies are there to support public not to Drink our Blood and collect money. This mess is Increasing Two wheelers in bangalore to the core and Car owners are suffering a lot. Bangalore traffic police is IDLE at the same time. Many times 3-4 500c will enter Banashankari bus stand , why dont you have timings fixed to them simple solution , i know inside bus stand difficult to have bus waiting as others need place. There are couple of places outside bus stand where it can be parked. Make ticket price affordable. Make Bus shelters in ORR first.